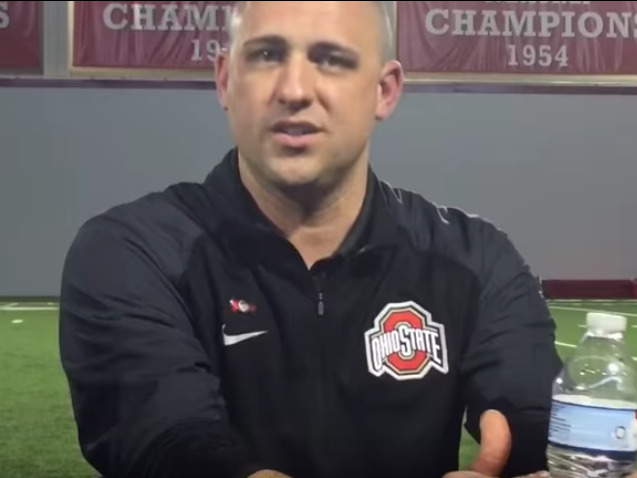 Stadium/YouTubeCourtney Smith spoke about the years of abuse she allegedly suffered at the hands of her ex-husband, Ohio State assistant football coach Zach Smith, in an interview with Stadium released on Wednesday. This week, Ohio State head football coach Urban Meyer was put on paid leave after a report came out alleging he knew assistant coach Zach Smith was abusing his wife, but did nothing. Smith’s now-ex-wife Courtney spoke out about the years of alleged abuse in an interview released by Stadium on Wednesday. She says she believes Meyer knew about the abuse because she spoke in detail about the alleged beatings to his wife, Shelley. Ohio State head football coach Urban Meyer was put on paid leave Wednesday while the university investigates a recent report that he knew one of his assistant coaches was beating his wife and did nothing. As the report surfaced, Stadium released an interview with axed assistant coach Zach Smith’s ex-wife Courtney, in which she expressed her belief that Meyer knew about the abuse allegations but chose to protect her former husband – his longtime mentee. “I do believe he knew and instead he chose to help the abuser, enable the abuser, and believe whatever stories Zach was telling everybody,” Courtney said. Courtney also went into detail about the alleged beatings, which led her to eventually divorce Zach Smith in 2016 and file a domestic violence civil protection order against him on July 20. The filing of that document, and the revelation of the years of abuse, led to Zach’s immediate firing from the program last week. Courtney and Zach met when they were both students at the University of Kentucky and got married in 2008, when Zach was working for Meyer at the the University of Florida. Courtney says the first time her husband physically abused her was in 2009, on their one-year anniversary. She said they attended a summer party at Meyer’s house, but she left early because she was pregnant at the time and not feeling well. Her husband decided to stay and go out drinking with some of his co-workers. The two got into a fight when he came home at 3 a.m. and asked that one of his friends stay the night on their couch. Courtney refused, drove the friend home and when she came back to the house, she told her husband to sleep on the couch. She said this caused him to snap. “He literally picked me up by my shirt and threw me up against the wall,” she said. The police were called and Courtney filled out a report. But eight days later she said she decided to drop the charges due to pressure from Zach’s family and Meyers’s attorney. Courtney said she sincerely believed that Smith wouldn’t hurt her again, and decided to give him a second chance. But when they moved to Ohio in 2011, she said the abuse started again and escalated. “He was living a very toxic lifestyle and every time I would question him, that’s when he became physically abusive,” she said. “It was out of control,” she continued. “I mean, he picked me up by my neck and threw me down on the ground in our bathroom and screamed at me ‘Look what you’ve turned me into!’ When it gets to that point, you realise your life is at stake,” she said. All the while, Courtney said the other wives in the program knew about her toxic marriage. When the abuse was going on, she said she didn’t detail the beatings, but the wives knew there were arguments and infidelity. After they decided to separate in 2015, and Zach allegedly threw her against a wall during a custody dispute, she said she told Meyer’s wife Shelley the full truth of the abuse. She said she sent Shelley some pictures of her injuries and her friend was shocked. Shelley expressed sympathy and appeared to really care about how she was doing, Courtney added. “Shelley thought … she was gonna have to tell Urban. I said, ‘That’s fine, you should tell Urban, we can’t have somebody like this coach young men.’ He’s supposed to be a mentor for young men,” Courtney said. Courtney said Shelley never came back and specifically confirmed that she had told her husband, but she’s never questioned that Meyer knew the truth. Cleveland.co/YouTubeZach Smith was fired from his post as Ohio State receivers coach on July 23, when his ex-wife filed a protective order against him that detailed years of physical abuse. When asked if she thinks Meyer should be fired for not firing her ex sooner, Courtney was torn. “That’s a tough question. When somebody is crying out for help, I believe the coach along with the coach’s wife have a duty, they have a duty to do something to help instead of worrying about winning games,” Courtney said. A day after Smith’s dismissal, Meyer issued a statement saying he knew about the assistant coach’s arrest in 2009, but that the charges had been dropped. As for the 2015 incident, Meyer claimed ignorance. “I was never told about anything. Never anything came to light, never had a conversation about it. So I knew nothing about it,” Meyer said on July 24.